I received this free to facilitate this review. Affiliate links may be in this posting. Thanks for supporting my blog. SmitCo LLC has several different diaries with lock and keys and other diary sets in Emoji and Diva themes, several different nail art sets to provide hours of fun, 3 unique princess dress up sets, and jewelry and jewelry sets in: rose gold, gold or rhodium plated, as well as very popular stretch sets for little girls. These are all affordable gifts for girls ages 2 to 12. Great for birthday or Easter. SmitCo LLC Scented Secret Scrapbook Kit is a really neat scrapbook that can be locked with a 4 digit passcode that comes with the kit. It comes with awesome scented stickers, craft tape, sticker jewels, feather pen and a pencil pouch. There is a total of 114 pieces in this set. This is great for a birthday gift or a sugar free solution to fill an Easter basket with. Recommended for ages 5 and up. 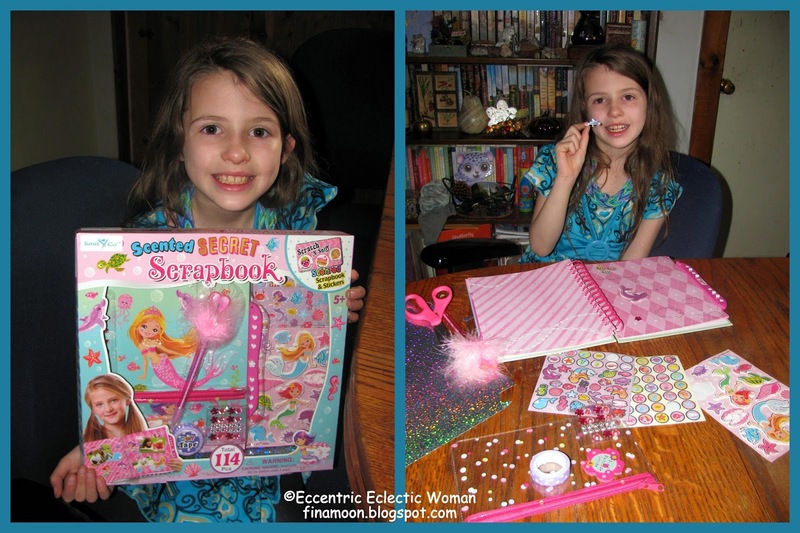 Teela having fun with the SmitCo LLC Scented Secret Scrapbook Kit. 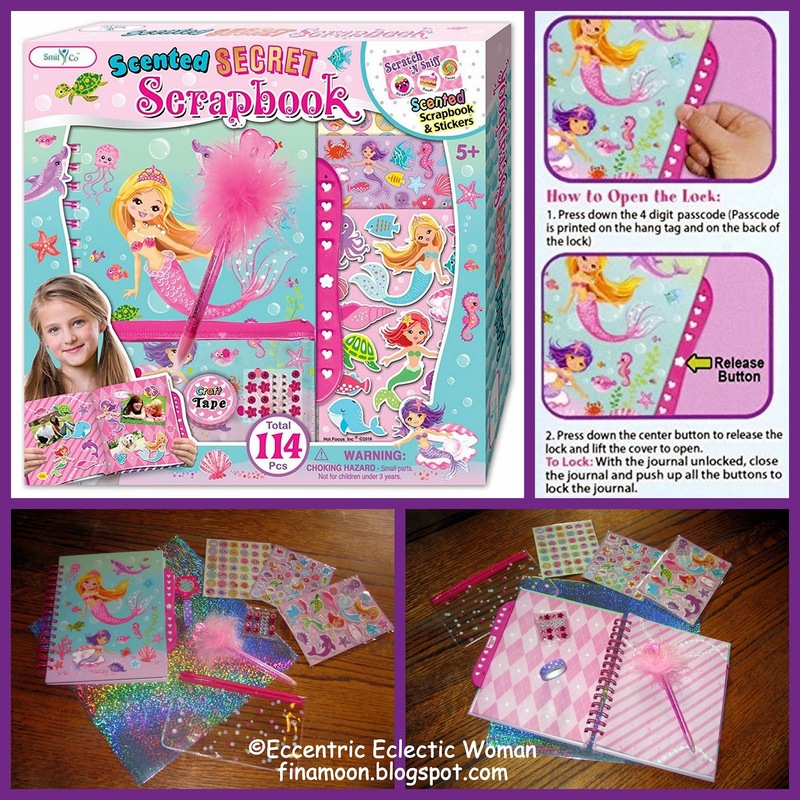 This Mermaid and Sealife themed Scented Secret Scrapbook Kit is super cute. My 8 year old daughter Teela loves to draw pictures in it and use the scratch 'n sniff stickers, jewels, and tape which reminds us of washi tape to decorate it with. This can be used as a scrapbook, picture/photo album, journal, and/or diary. Teela loves that she can personalize it herself and make it her own. She also thinks that it is cool that it locks so that her older brothers can not see her journal entries. The required passcode to open it makes it perfect for her to keep everything inside a secret. The scrapbook and stickers are both scented with a sweet smelling fragrance that to us smells like grape. Some of the embellishments can fit inside the pencil pouch to keep it all neat. The fancy feather pouf pen with a pink heart is delightfully girly as well. The passcode numbers for all of these scrapbooks are the same and you can not change it, however. My daughter loves this kit and was even using the prism sheet that came in the box as a background for the items to cut out shapes to glue in the book as well. *Does not come with the scissors in the second picture. This was a great early birthday gift for my daughter! Find some or all gifts here for the princesses on your list! My readers get to save! Get 20% Off Entire Cart Of Gifts! Go to: http://amzn.to/2nrO0aVand use coupon code N3CQD6AE at checkout. DISCLOSURE/DISCLAIMER: I received this product for free to facilitate this review. My thoughts are mine and my family's own opinion and have not been altered by anyone else. I did not receive any other compensation for doing this review. Affiliate links may be in this posting. Thanks for supporting my blog.